Congratulations ! The original artwork is available for purchase for $1337.60 shipping included. You will be able to review this purchase in the subsequent screens. If you have a question, please email support@pastelspace.com. Purchase 1986 x 1500 pixel digital file by using the Buy Now buttons below. You will receive an email with the download link. You can use the link 5 times to download the digital file. 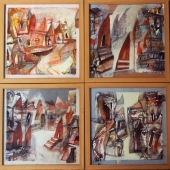 Tapas Ghosal's paintings based on Varanasi portray a temporal and spiritual dimension. They reflect meditative structural spaces that echo an inner silence and extract mystic, melodic vibrations. 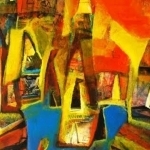 The contrast of red, blue and ochre make it a resplendent, almost magical composition..
New artwork uploaded. 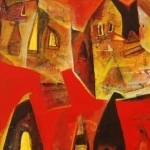 Tapas Ghosal's paintings based on Varanasi portray a temporal and spiritual dimension. They reflect meditative structural spaces that echo an inner silence and extract mystic, melodic vibrations. 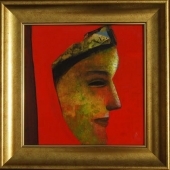 The contrast of red, blue and ochre make it a resplendent, almost magical composition. Tapas graduated in Painting with a First Class First from Govt. 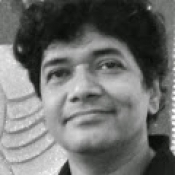 College of Art & Craft, Kolkata, 1989; and received his post graduate in Painting from Benaras Hindu University, Varanasi (First Class). 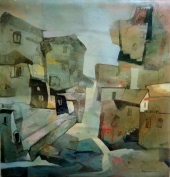 His Varanasi works reflect a temporal and spiritual dimension. The pastel shaded images are semblances of an isolated image of what the artist perceives beneath the bustling activities there. 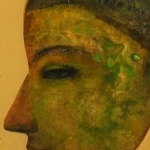 His current series of paintings create meditative structural spaces, melancholic in nature which enter into the inner realm of reality and extract a kind of mystic, melodic silence.